I sent this year’s dumb letter in the mail yesterday. It was probably the lamest dumb letter I’ve written them, especially compared to last year’s emotional keening about Summer’s Middle Eastern roots and the fears I have for her in Trump’s Muslim-hating America. I should have known better than to get emotional – they didn’t respond. But they never respond, so what does it even matter anymore? This year’s letter was practically a form letter: I hope you are well. I got married. We’re planning to have a baby. Please write. I didn’t have the heart for it this year. All of that thinking about whether to include a picture…meh. I’ve given them my full name from the beginning, and I’ve given them my phone number, email address, and physical address in every letter for years now – if they cared about who I was, they would have reached out through one of those avenues by now. Sending a picture isn’t going to make a difference, except that they’ll know which face in the crowd to avoid. I’ll keep that tiny piece of anonymity, thank you. Besides, my Facebook profile is public – that means you wouldn’t even need an account to go there and see what I look like. If they cared enough. It’s been a rough few months. I was searching my Chrome browsing history the other day, hoping to find the recipe for the most amazing cookies I’ve ever made (because somehow I didn’t save it to my recipe box app – what was I thinking!? ), and I made it all the way back to September and found ‘birthmother’, ‘first mother’, ‘adoption’, ‘adoption blog’, ‘adoption podcast’, and more searches littered throughout. I didn’t realize how much of this past year I had spent thinking about adoption and Summer and trying to find support in the online community. It was kind of eye-opening. I’ve spent most of December in the funk of depression. Partly for no reason (that’s how depression works), though there may be other factors playing in: I changed my entire lifestyle by quitting smoking on December 1, the days are short and dark and the weather is turning bone-chilling cold, I was sick with a flu for a week, followed by double eye and ear infections for another, I went off my birth control this month in preparation for conception in January, and I miss my daughter and have been thinking a lot about it. Despite feeling hopeless and lonely and depressed, I managed to commit a few pathetic paragraphs to paper without sounding like the jerk I feel like I am, without demanding they respond like they promised they would. And then I managed to send it. And now I have cookies. Are you dealing with the winter blues? Do you want my recipe for the Best Chocolate Chip Cookies Ever Made? Leave me a comment! 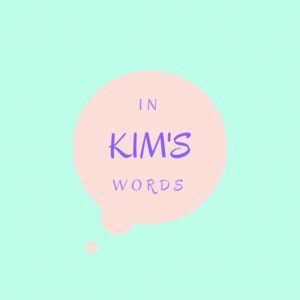 Subscribe to In Kim’s Words for more posts about my Dumb Letters (and maybe even my chocolate chip cookies!). Lovely sorrow. I feel your pain. So glad you quit smoking. It will be 28 years for me on June 4, 2018.